Congregation of Wits | Where's my backpack? Rome is filled to bursting with spectacular statues in pristine condition but the one that really won a place in my heart is worn and eroded and in such poor condition you can barely make it out. What it lacks in definition, however, it more than makes up for in aiding and abetting civil disobedience. 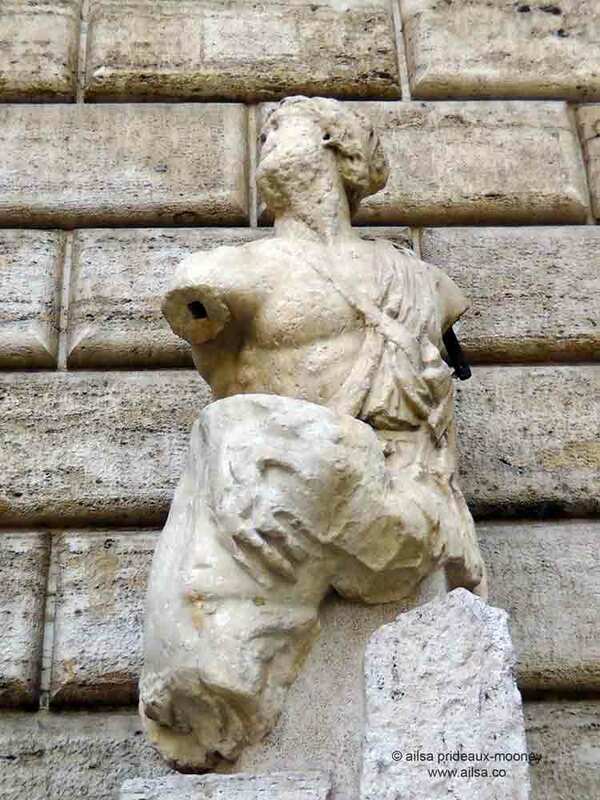 Just off the southwest corner of the Piazza Navona you will find the infamous Pasquino; a limbless male torso believed to represent Menelaus, the mythical king of Sparta. His long since disconnected hand appears to be grasping another torso, possibly the dead body of Patroclus in a representation of a scene from The Iliad. The statue, dating from around 3BC, was unearthed during road construction in 1501 and put on display in this small piazza now named Piazza Pasquino in its honour. Where it got the nickname Pasquino also remains a mystery. One story has it that the statue was discovered near an inn run by a man named Pasquino. Another more elaborate story tells of a man named Pasquino whose work (as a tailor or a teacher depending upon the story teller) caused him to frequent the Vatican. The Vatican ruled all of Rome at the time, and Pasquino, with access to behind-the-scenes intrigues, was in the perfect position to get the inside story on who was doing what to whom. When he would return from his frequent visits to the Vatican, he took great delight in fuelling Rome’s gossip mill with the latest goings on, often adding his own ascerbic commentary to the mix. When Pasquino died, his fellow citizens named the statue after him and started attaching anonymous comments to the statue, lampooning the ruling class, much as Pasquino had done during his lifetime. The English word pasquinade, meaning a lampoon or criticism posted publicly, owes its origin to this tradition. The Popes were often the target of the derision. Pope Adrian VI so dreaded the criticisms posted on Pasquino that he suggested the statue should be thrown into the Tiber. The only thing that stopped him was the fear that Romans would ridicule him for being afraid of a statue, so dear old Pasquino remained where he was. Instead, armed guards were posted in the piazza to prevent anyone leaving anonymous notes. And so the Congregation of Wits was born. Within days, other statues around town started ‘talking’ too. Marforio, a reclining Roman river god at the northwest end of the Roman forum, was the first to respond – and often had animated ‘discussions’ with Pasquino. Notes posted on one statue would be responded to on the other statue and so the discussions would bounce back and forth. Marforio was moved to several different locations around the city but kept talking until the Vatican finally decided to enclose him in the courtyard of the Palazzo dei Conservatori up on Capitoline Hill, where he still resides today. The powers responsible for his incarceration said it was in order to keep the statue safe; although many believe the real motive was to keep the statue quiet. Other statues now got in on the act too – Il Faccino (The Porter) on the Via del Corso mocked the ruling classes while dispensing water from his stone cask; the lovely Madama Lucrezia added the sole female voice to the congregation; and the statue of Abbot Luigi, now located close to the Basilica di Sant’Andrea della Valle, also joined in the political and religious satire. This last statue is believed to be of an unknown emperor of Rome; unknown because the head belongs to another statue. That’s not entirely true, however, as Abbot Luigi has been known, on occasion, to lose his head – when someone steals it. Luckily, however, his head always seems to find its way back. Rounding out the congregation of wits is the most startling of statues. When I was making my way from the Spanish Steps to the Piazza del Popolo I followed the curiously named Via del Babuino (Baboon Street). 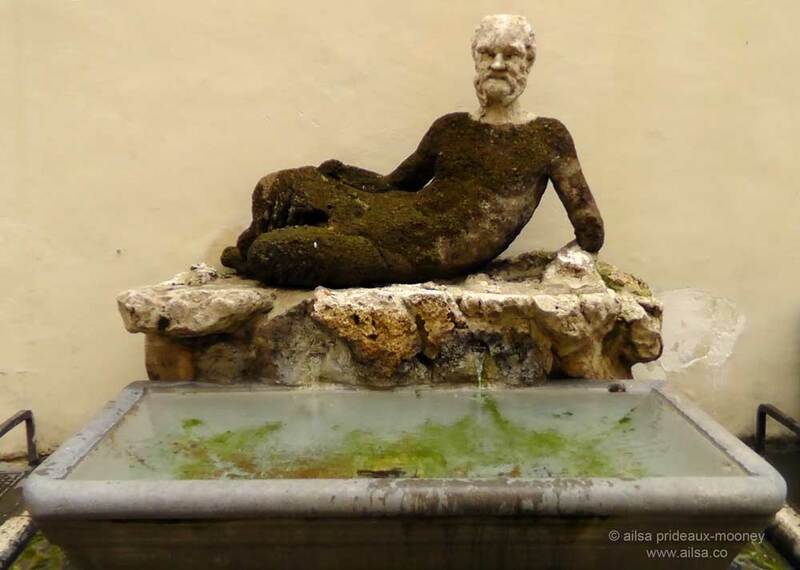 Halfway along I spotted a rather hirsute-looking statue lolling over a trough of water. It’s a statue of Silenus; a drunken pal of the god of wine and fertility, Dionysus. It’s a superb representation of a lecherous drunkard on the prowl, but early Romans found the statue so grotesque they quickly nicknamed it The Baboon and the nickname stuck. His location in a largely unpoliced part of 16th century Rome made him a vociferous member of the Congregation of Wits. I suspect he wasn’t the politest of commentators. Oddly, I didn’t spot a single note attached to Rome’s talking statues. The wall behind Il Babuino used to be thick with graffiti but now, thanks to graffiti-proof paint, it is starkly blank. But judging by the expression on the statue’s wizened old face, I suspect he’s still got an awful lot to say. I love Rome so much! Try walking around the city at 3 in the morning. It’s magical. A fascinating bulletin, Ailsa 🙂 I wandered in nonchalantly seeking the Friday challenge and got a very entertaining history lesson instead..
Well, I guess it relates to this 🙂 Right now I can’t see well enough to photograph anything- just a wash of rain! Better than yesterday’s hailstone? At least that was exhilarating. The weather’s been nuts this year, Jo, I’m convinced we’re all going to sink! They’d have soooo much to say! I’m off hunting for some statues for your travel theme now…. This story is to wonderful not to repost. I have got to start using the word “pasquinade” more often. It’s such a wonderful history and the pictures, as always, work wonderfully! Thanks again for posting! Congregatiion of Wits…what fun! I’m sure Silenus will find a way of continuing his conversations. I wonder what the statues in Dublin have to say? Certainly. I won’t be able to simply walk past any statue, in any town, without my imagination now running wild! Loved your story. Rome is one of my favorite cities. Need to get back there soon.